Please indicate which shift is best for you. Thank you! All volunteers will receive lunch and a brief training upon arrival. Join us in providing hope, opportunity and second chances. Many volunteers will be needed to help in the following areas: Registration, job application assistance, and general job readiness coaching and support. Employers: Host a booth at no cost and interview job seekers. Free lunch included. 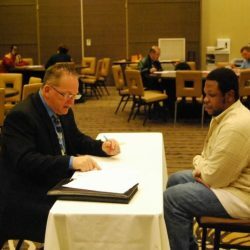 This Career Fair is being held for individuals that are on probation or parole, have past involvement in the criminal justice system or domestic relations involvement. Parking at the DoubleTree is free. Enter the hotel parking garage through the Penn Street entrance.